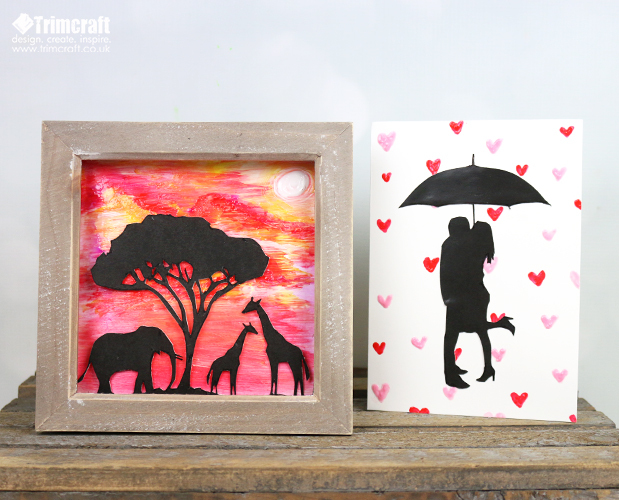 It’s a lot of fun creating a silhouette project as it allows your creativity to go wild, especially with the vibrant Dovecraft Enamel Effect glue collection. 1.With your printer, print the design in black onto a sheet of A4 Dovecraft white card. Make sure the printer is set to the maximum ink coverage setting. TIP: You can resize the design for different projects. 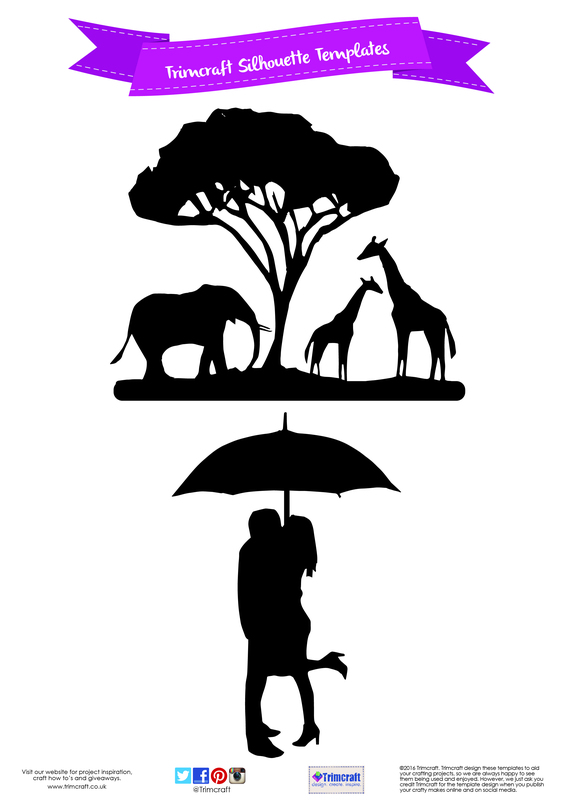 2.Place the safari scene on your cutting mat and carefully, cut out the design with a craft knife. Take your time as this template contains detailed sections. 3.Once complete, go around any edges that have visible white card left with a black Sharpie pen. This will enable you to achieve a clean cut design. 4.Place 3D adhesive foam squares to the back of your silhouette, ensuring to cover the majority of the template so that it will be secure on your painted design. 5.Next, cut an A4 Dovecraft white card down to 15cm x 15cm. To create the safari sunset, begin by squeezing out the red, purple and yellow Dovecraft Enamel Effect Glues to the centre of your card. 6.You will want the sunset scene to be dense with colour so don’t be hesitant with how much glue you’re using. Begin brushing the colours horizontally across your paper with the First Edition Nylon brush. 7.Cover your entire paper with these colours, by mixing and blending them. Go heavier toward the top of your design to create the appearance of clouds. Once you’re happy with your sunset scene, squeeze out a sizeable amount of white Dovecraft Enamel Effect glue in the top right corner. Carefully swirl out the white glue to create the sun and then leave to dry. 8.The glue may curl your card so place your design under a heavy book until you’re happy with its’ appearance. Adhere your silhouette to the bottom of your card and place it inside your frame. With the other design in your download, you could either create a home décor piece or a card that would make a fantastic anniversary or Valentines day gift! Follow the same steps of cutting out the silhouette but for the background, use the nozzle on your Dovecraft Enamel Effect glue to create a repeat heart pattern. Mix the colours to add interest to your project! How will you use our free silhouette printable with the Dovecraft Enamel Effect glues? We’d love to see your inspired makes so remember to upload your crafts to the Inspiration area and to #Trimcraft when uploading on social media.